What it must be like for Ravi Coltrane as a saxophone player. An easy refrain I’ve been known to fall back on when describing albums that were good but not truly exceptional is “It wasn’t quite ‘A Love Supreme’, but…” I can imagine a phrase like that must have added weight for the son of John Coltrane, who, even more than all saxophonists, probably lives under the shadow of his father. John Coltrane’s is a particularly difficult legacy to live up to because he is remembered not merely as a truly talented player but as an innovator who changed the the way that people approach music forever. It is this particularly challenging legacy, that of musical innovator, that Ravi has chosen to try and live up to, and up to now, he has been fairly successful at it. He has established himself as a very capable member of the current generation of tenor saxophonists, at home both in his own material and in reinterpreting the classics (including a fascinating, odd meter take on his father’s 26-2). 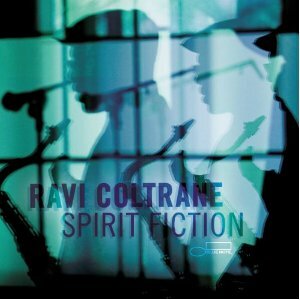 A few weeks ago he came out with a new album, ‘Spirit Fiction‘, which seeks to continue the process of innovation. ‘Spirit Fiction’ is a cerebral work, often challenging. Ravi is clearly concerned with producing a unique album and pushing the music forward. He does this in two ways, first by crafting an album around two bands, one a quartet with pianist Luis Perdomo, bassist Drew Gress and drummer E. J Strickland, the other a quintet with Geri Allen on piano, James Genus on bass, Eric Harland on drums and trumpeter Ralph Alessi. (Joe Lovano also makes an appearance on a couple of tracks) The second is by trying to push the instrumentation by a creative use of the recording studio. The opening track, ‘Roads Cross’, was created by recording the quartet as two separate duos playing the track at the same time in different recording booths and then mixing the results together. It sounds pretty much like you would expect, somewhat jarring and not quite synced. Two more tracks utilize this method as well, the creatively titled ‘Cross Roads’, which after a jarring first minute or two actually starts to swing, and the title track, easily the most successful of the three, which works much more smoothly due to its rubato flavor. As an intellectual exercise, it’s a fascinating idea, but not particularly satisfying in execution. I much prefer the quintet tracks, particularly Alessi’s ‘Klepto’, which groove in a way the more experimental tracks do not. All in all, a mixed bag, though the more successful tracks are worth the price of admission. On the opposite end of the spectrum is guitarist John Abercrombie’s new album, ‘Within a Song‘, which, rather than forward thinking and innovative, is a love letter to the music of the 60’s. It is almost exclusively made up of versions of other musicians compositions, not standards, but rather tracks very clearly associated with their original artists, like Ornette Coleman’s ‘Blues Connotation’ or Coltrane’s ‘Wise One’. Interpreting these compositions with a sense of quiet swing is Abercrombie, Joe Lovano on tenor saxophone, Drew Gress again on bass and Joey Baron on drums. It’s hard to imagine making a soft, straight ahead album with more appeal than this. Joe lends his considerable improvisational chops and tone to a rhythm section with an overabundance of touch. This is an album that doesn’t try to be more than it is, but what it is is spectacular.